1. What is the tested payload capacity of the Ronin-S? 2. What are the Ronin-S’ weight and dimensions? It weighs 1.86 kg, and its dimensions are 202×185×486 mm. 3. What is the operating temperature of the Ronin-S? 4. How do I activate and use the Ronin-S? a. Press the power button once to turn on the grip, and then hold the gimbal power button to turn on the gimbal. b. Enable Bluetooth on your mobile device and launch the Ronin app. Select “Ronin-S” and input the default Bluetooth password 12345678 once it’s detected. c. Make sure you are connected to the Internet and follow the on-screen to activate the Ronin-S for the first time. d. After activation, double tap the gimbal power button to engage the motors before proceeding. 5. Can Ronin-S work with other platforms? 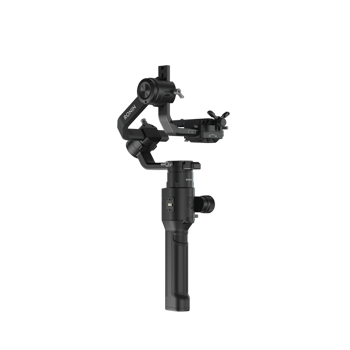 With the optional universal mount, Ronin-S can be attached to a remote buggy, car, cablecam, monopod, jib arm and dolly. 6. How to use the Ronin-S Roll 360? 7. How do I enable portrait mode with the Ronin-S? Press the Trigger three times. 8. How do I center the Ronin-S’ gimbal? 9. How do I enable Sport mode with the Ronin-S? Press and hold the M Button to enable the Sport mode, release the button to return to the previous mode. 10. How to use Sport mode and Lock mode? Press and hold the M button to enter Sport mode. Then double press the front trigger button to turn on the Lock mode. In this case, the gimbal can enter Sport mode without pressing the M button. Repeat the steps to exit Sport mode. 11. How does Sport mode differ from other modes? Compared with other modes, the Sport mode allows the gimbal to respond to movements quickly with fast-tracking speed and acceleration. 12. How many profiles are available for the Ronin-S? The Ronin-S supports three profiles, which can be customized by users themselves. The default profiles 1, 2, and 3 on the Ronin-S correspond to slow, medium, and fast speeds. 13. What tools are required for assembling and balancing the Ronin-S? The Ronin-S has an integrated design. Only two hex keys are required when mounting and securing the Focus Wheel. 14. How can I balance the Ronin-S? 1. Which battery model is used with the Ronin-S? 2. How long does it take to fully charge the Ronin-S? It takes approximately two hours to charge the battery fully when using the 24W USB Power Adapter. 3. How long can the Ronin-S’ battery last? 4. Can the Ronin-S supply power to third-party accessories? Yes.The adaptive cable will be added in the near future. 5. How many batteries come with the Ronin-S? 6. How can I turn the battery on or off? Press the battery’s power button once to turn it on. Press the battery’s power button once and then press and hold it to turn it off. When the battery is idle for 12 hours, it will automatically turn off. 1. What cameras are supported by the Ronin-S? 2. How can I control the camera’s shutter after the camera is mounted to the Ronin-S? After the camera control cable is connected to the RSS port, users can take photos or record videos by pressing the camera control button. 3. How to connect the RSS-IR Control Cable to the Ronin-S? The RSS-IR Control Cable’s infrared light should face vertically to the camera’s receiver, and there should be a 1-3 CM gap. During the operation, to prevent the RSS-IR Control Cable from moving (which may cause control insensitivity), shorten the RSS-IR Control Cable’s movable part. 1. How do I ensure that the Focus Wheel has been mounted correctly? After the gimbal is powered on, the Focus Wheel’s indicator will blink red once, indicating that Focus Wheel is not connected. If the Focus Wheel’s indicator is solid yellow, it means that the external Focus motor is detected, but the calibration is not done. If the Focus Wheel’s indicator is solid green, the camera supporting E-Focus Control is connected, or the external Focus motor is connected, and the calibration was done. If the Focus Wheel’s indicator blinks green twice, the motor’s A and B points have been set. 1. Can I auto tune the Ronin-S with the Ronin app? Yes, power on the Ronin-S after it is balanced, go to the app’s Setting screen, and tap “Auto Tune”. 2. Can I set the Ronin-S’s SmoothTrack settings with the Ronin app? Yes, connect the Ronin-S to the Ronin app, tap “Configuration” and “SmoothTrack”, and adjust the Speed, Deadband, and Acceleration values for the pan, tilt, and roll axes. 3. How can I check the operating status of the Ronin-S’ motors? Launch the Ronin app, tap “Configuration” and “Motor Parameter”, then you can check the Stiffness, Strength, Filter, etc. 4. How can I check the operation status of the Ronin-S’ peripheral devices? Launch the Ronin app, go to the main screen, and tap “Status” and “Checklist” to check the connection status of the peripheral devices. 5. How can I check the battery’s operating status? Launch the Ronin app, go to the main screen, tap “Status” and “Battery”, and check the battery’s voltage, temperature, remaining power, total capacity, etc. 6. How can I change the Ronin-S’ connection password? Launch the Ronin app, tap “About” and “Device List”, and modify the device’s name and password. 7. Can I update the Ronin-S’ firmware with the Ronin app? The Ronin app can be only be used to adjust the Ronin-S’ settings. It does not support firmware updates. To update the Ronin-S’ firmware, please use the DJI Assistant software for Windows or Mac. 8. Can I control the gimbal in the Ronin app? Yes, launch the Ronin app and tap “Create” to change the gimbal’s orientation. 9. What intelligent shooting modes are supported by the Ronin-S? Panorama, Timelapse, Motionlapse, and Track are available. 10. What is the Ronin-S’s wireless controllable range? When using the Ronin app to control the Ronin-S, the controllable range is around 10 meters in an open environment free of interference. When using a third-party control system, the controllable range varies. For details, please consult the third-party control system’s manufacturer. When using the DJI Pro Wireless Receiver, the controllable range can reach up to 3 km in an open environment free of interference.